Get firmer launches and improved handling for your S197 with this 2005-2014 Mustang Steeda rear upper control arm install! Remove the rear seat cushion by pushing in and up at the center of each seat. Remove the 24mm bolt that was located under the seat. Raise the vehicle via a lift or jack. Loosen the upper control arm to axle nut with a 13/16" deep socket. Finish removing the nut with a wobble extension. To easily remove the bolt, support the rear end with a jack or pole back and remove the bolt. Remove the two 18mm bolts securing the mount to the body and remove the mount from the car. Grab the Steeda control arm and mount and tap the control arm into the mount to seat the spherical bushing. Position one of the included washers over the included bolts and slide the bolt through the bushing and add a washer to the bolt. Apply blue threadlocker to the bolt and torque the nut down to 129 ft/lbs. Once the proper length is achieved, loosely tighten the adjusting nuts. Ensure that the flat spot on the control arm is facing up toward the car, and tighten both adjusters down with open end wrenches. Put the new Steeda control arm into place and loosely tighten the previously removed 18mm bolts. Using your jack or pole jack, raise the front most part of the rear end to help adjust pinion angle and ease the installation of the control arm. Slide the factory bolt into the control arm and axle mount and loosely tighten the bolt using an 18mm and 13/16 socket. Fully tighten the bolts securing the mount to the body. Torque the nut to 129lb/ft. Lower the car and grab the included washer and allen head bolt. Position the washer over the hole in the floor and apply blue threadlocker to the bolt & tighten down. Reposition the lower seat and you are all done. Steeda’s adjustable rear upper control arm and heavy duty chassis mount is designed with the serious Mustang enthusiast in mine. This Steeda rear upper control arm is double adjustable, features a chrome-moly rod end, heavy duty construction and bolts directly to the included chassis mount which is manufactured out of a beefy quarter inch thick steel. Both pieces are even powder coated silver to offer years of durability. This combo from Steeda will outfit your Mustang with firmer launches, improved handling, and most of all wipe out that annoying wheel hop which is all-to-apparent in the S197’s factory suspension. Each of these are a direct replacement for all 05-14 Mustangs and pair perfectly with a set of rear lower control arms. Hey! What’s happening guys? Landan here with Late Model Restoration. Today I’m going to be giving you my quick breakdown on Steeda’s adjustable rear upper control arm and heavy duty chassis mount fitting your 2005-2014 Mustang. With over 25 years under their belt, they are still one of the #1 aftermarket Mustang parts manufacturer in the industry. Their extensive research and development has produced top notch, high quality parts that get your Mustang performing, handling, and looking the way it should. Steeda’s adjustable rear upper control arm and heavy duty chassis mount is designed with the serious Mustang enthusiast in mine. They call it a competition upper third link for a reason. 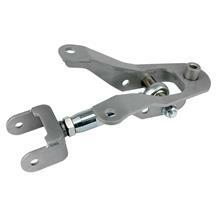 This thing is double adjustable, features a chrome-moly rod end, heavy duty construction and bolts directly to the included chassis mount which is manufactured out of a beefy quarter inch thick steel. Both pieces are even powder coated silver to offer years of durability. This combo from Steeda will outfit your Mustang with firmer launches, improved handling, and most of all wipe out that annoying wheel hop which is all-to-apparent in the S197’s factory suspension. Each of these are a direct replacement for all 05-14 Mustangs and pair perfectly with a set of rear lower control arms. With that being said guys; I’m going to show you the detailed steps on installing Steeda’s rear upper control arm and chassis mount into this 2014 GT. To begin installation, remove the rear seat by pressing in and up at the center of each side. Remove the 24mm bolt. Place the car on a lift or jack stands as high as you can get it. Loosen the upper control arm to axle nut with a breaker bar and 13/16” deep socket. Finish removing the nut with a wobble socket and six inch extension. A secondary socket is not needed since the bolt head incorporates a locking tab. To make the bolt easier to remove, support the rear end with a jack or pole jack. Carefully remove the bolt from the axle bushing and upper control arm. Use a dead blow and pry bar if necessary. Before you completely remove the bolt, apply pressure to the top of the control arm since there will be some tension when you remove the bolt. Remove the two 18mm bolts securing the upper control mount to the body and then remove the mount from the car. Grab the new Steeda upper mount and control arm. Position the spherical bushing into the upper mount and tap it into place with a dead blow. We chose the bolt holes closest to the front of the mount since this car will primarily be street driven with occasional track duty. Once aligned with the bolt holes in the upper mount, slide one of the included washers over the included bolt. Position the bolt through the upper mount and control arm. Slide the remaining washer over the bolt. Apply blue thread locker to the bolt threads. Fully tighten the nut to 129 ft/lbs. Just a reminder, since this control arm features a spherical bushing; noise, vibration and harness will be increased. Before adjusting the Steeda upper control arm, measure the distance between your factory mount and control arm. It should measure thirteen inches exactly from the front body mount and the axle side. Remember to measure center to center on each bolt hole. Adjust the Steeda control arm to the appropriate length. Loosely tighten both jam nuts. Before fully tightening them down, ensure the small metal brace on the rear of the control arm is facing up toward the body of the car. Now, fully tighten the jam nuts using a series of open end or crescent wrenches. Double check and make sure the pivot point at the rod end is not crooked, and is 100% parallel with the body mount. Position the Steeda mount and control into place and loosely tighten the previously removed 18mm bolts. Using your jack or pole jack, carefully jack up on the front most part of the rear end. This will help adjust the pinion angle and will make reinstallation of the axle bushing bolt a lot easier. Slide the factory bolt back through the bushing and loosely thread the nut. Tighten the nut using an 18mm socket on the bolt head and a 13/16” deep socket on the nut. Fully tighten the two 18mm bolts securing the mount to the body. Now, torque the nut to 129 lb/ft. Lower the car and jump back inside with the included washer, Allen head bolt and blue thread locker. Position the washer over the hole in the floor. Apply blue thread locker to the threads and tighten the Allen head bolt with a 12mm Allen socket. Re-position the lower seat and you’re all done. As far as installation goes fellas, I would recommend access to a lift if you have that luxury. If not, this can still be managed off of jack stands. However, whatever method is most easily obtainable, this install should take no more than two hours. One other thing before I let you guys go, pinion angle is definitely something to be concerned with. More than likely, most of you will be installing these two components onto a lowered Mustang; make sure you adjust the Steeda rear upper control arm to the factory length and you’ll be completely fine. If, however, pinion angle is something you need to adjust, refer to your instructions from Steeda as they make it extremely clear on how to do so. If you guys want to continue watching the best install videos for your S197 Mustang, then hit the subscribe button that way you can stay up-to-date with all of our great content. Until next time fellas, head back over to the site and grab a Steeda adjustable rear upper control arm and chassis mount for your 05-14 Mustang at LMR.com!